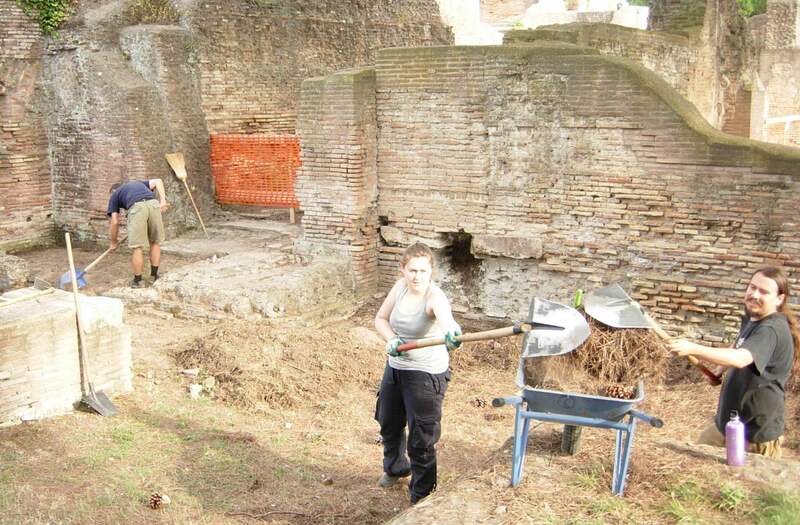 The University of Kent team have returned to Ostia for a season of laser scanning and documentation, trying to problems in their records and finish the study of finds, whilst excavating a couple of new areas which we didn’t manage to cover in 2010. 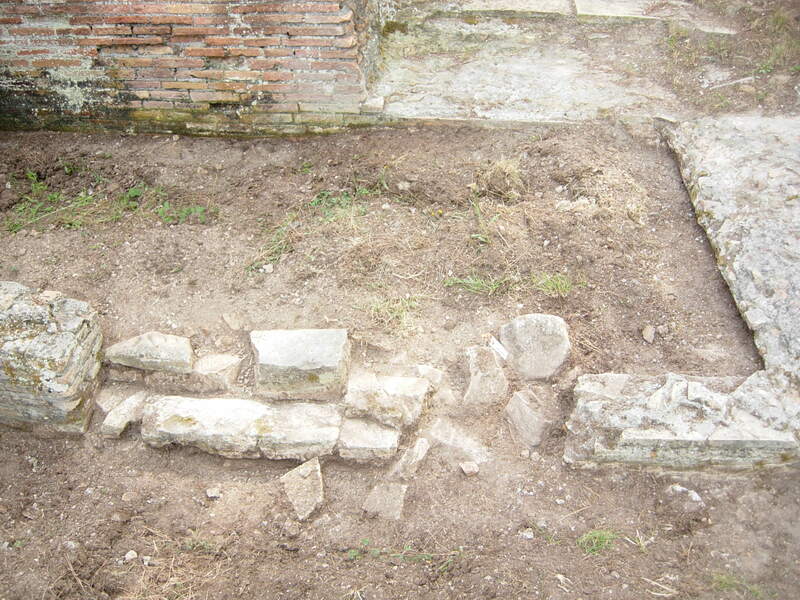 Today the head of the Ostia section of the sopraintendenza, Professor Angelo Pellegrino, gave us the go-ahead to start our work, which will encompass cleaning of the Piazza della Vittoria Nymphaeum, as well as the areas excavated in previous seasons. 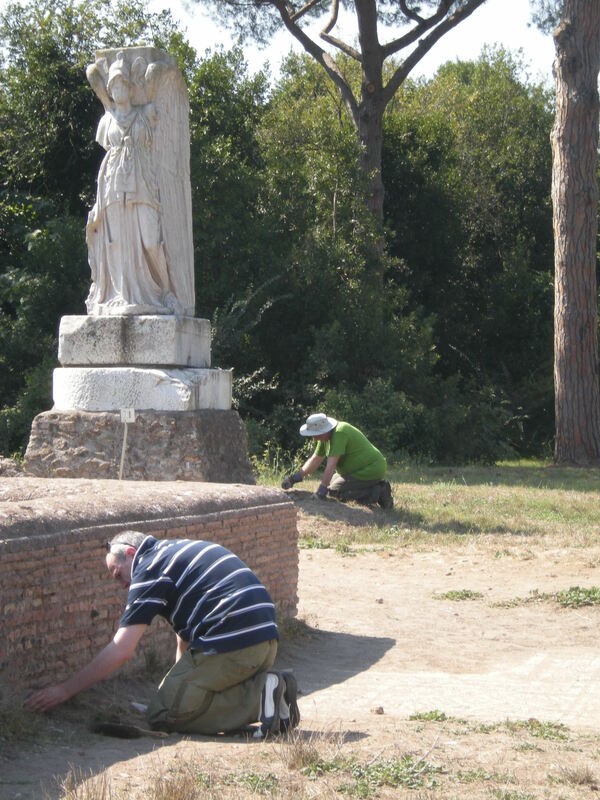 We were also granted permission by Professor Pellegrino to clean our coins this week and take them for specialist analysis, which will reveal much about the dating of structures in our working areas. He was very pleased to see our report for 2008-2010 at last, which it was a great pleasure to put into his hand. Today we began intensive devegetation across the site, with our 15 or so participants donning gardening gloves and taking up shears. Insect bites were many, and it was as usual fearsomely hot. But even amidst this repetitive work discoveries were made: in the Foro della statua eroica deveg uncovered a late blocking wall of reused blocks in the doorway of a building beneath the square, which itself encroached on a former street, sometime in the 3rd or early 4th c. Faith Morgan found a coin which may help date this, and a concentration of red wall plaster which may relate to the decoration of the room. Elsewhere Doug Underwood finished off our site grid in preparation for laser scanning, whilst back at the chalet Eddie, Michael and Helen sweated over the archive to prepare records for the start of major works tomorrow. « Lurus, you shall die!